Baltimore students exploring vocational career paths after high school had their horizons broadened about an often overlooked profession during a demonstration at a city vocational school Wednesday. BALTIMORE — Baltimore students exploring vocational career paths after high school had their horizons broadened about an often overlooked profession during a demonstration at a city vocational school Wednesday. 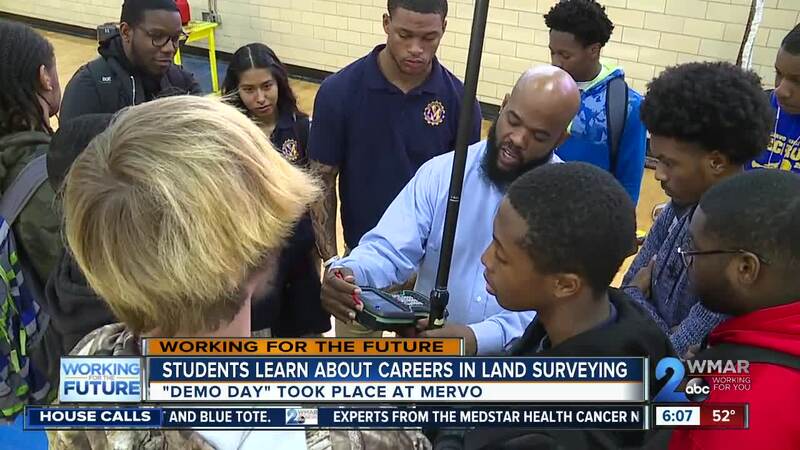 The Urban Alliance, in partnership with the Maryland Society of Surveyor’s, held a demonstration at Mergenthaler Vocational-Technical High School Wednesday that introduced students to careers in the field of surveying. The event was the second year of the partnership between the organizations. Roughly 75 students from MERVO, Baltimore Leadership School for Young Women (BLSYW), Green Street Academy, and the Reach! Partnership School attended the demonstration. During Wednesday’s event, students were able to circulate through demonstrations of different surveying tasks that utilize some high end tools and technology like drones, laser scanners, and robotics. Students can pursue paid, full-time summer internships in the surveying industry, as well as a pre-employment job skills boot camp. Last year two students who completed the internship were offered full-time positions. “The internship, it was really a learning experience because some things you learn about yourself you didn’t know,” said Shania Savage, a 2018 graduate of BLSYW who completed a surveying internship and in June was offered a full-time job as an engineer. She said she learned how to dress and act professionally and how to work in a team. Only about 43 percent of students in Baltimore City Schools enroll in college after high school, well below the national average of 70 percent, a statement from the Urban Institute said. One in nine young people in Baltimore are disconnected from work and school, underscoring issues connecting students to a college education or a career pipeline. Simultaneously, specialized careers that do not require college education are increasing swiftly, the Urban Alliance said. In particular, surveyors are retiring at a high rate, creating opportunities for young people who are interested in the field. The current average age for a surveyor in the United States is 58. Beginning with the exposure to the industry students received Wednesday, and the internship opportunities they learned about, the Future Surveyor’s Program can aid students with test preparation for national certification exams and afford them an opportunity for enough pre-work training to accelerate their new careers.